One of the nice things of macro photography is that is opens a whole new world. By going down on your knees and taking a closer look at the vegetation, you suddenly see many different insects on the leaves. 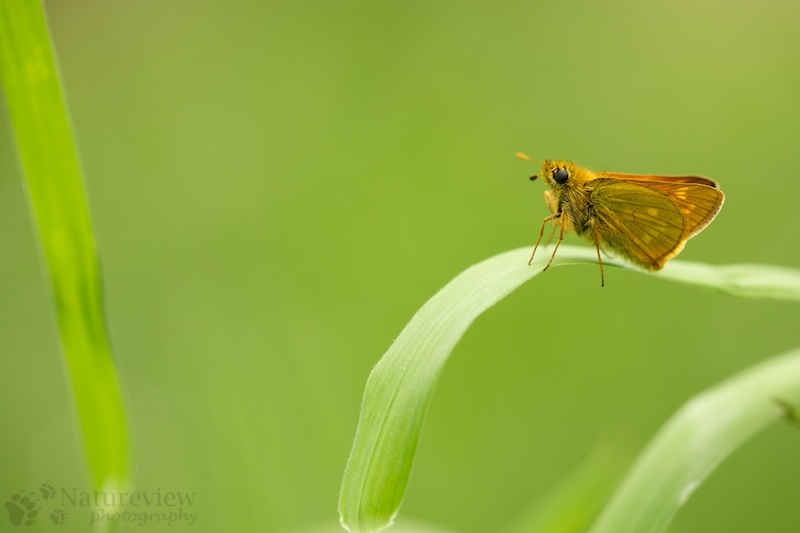 During our workshop of today we found this Large Skipper. Jaap started to take some pictures of it, while the participants still were trying to find the small butterfly. In this picture I left some space around the skipper, to show its small size. Macro … so much harder than it looks sometimes, but this is nicely done! I’m curious, are you using a Canon lens? I like your aperture choice, but I often like the subject to be the main focus and not have to compete with the background. Thanks for the compliment. No, I use the Sigma 180mm macro. In a gras-situation I never use a too small aperture, as that will give a larger depth of field, resulting in a more in focus and thus distracting background.